Tales of survival have always fascinated people. It’s an enigma that’s just as elusive as the dangerous journey of survival, but there’s just something about these stories that keeps viewers invested in the tales being told and the overall outcome of what happens to the individual / individuals. Whether it’s the battling the uncontrollable elements of nature and the surrounding area of wildlife to the psychological mental breakdown of a person’s sanity, tales of survival are captivating in their own right, finding a sort of inspirational silver lining in this dangerous (almost life and death) scenario. Of course, Hollywood has taken a shine to producing such survival stories to the big screen, including fictional ones like The Mountain Between Us, The Martian, The Revenant, and Cast Away to films being based on true life events like Apollo 13, The Impossible, Into the Wild, Alive, Everest, and 127 H? ours. 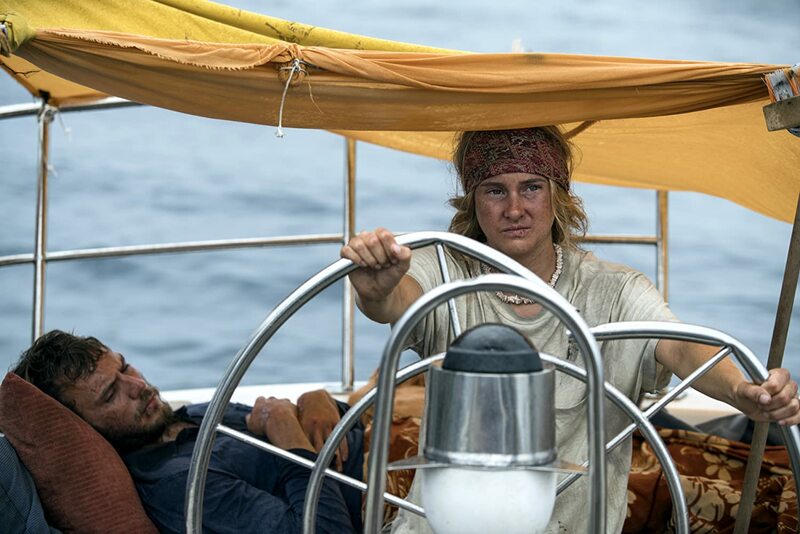 Now, STX Films, Huyai Brothers Pictures, and director Baltasar Kormakur present the latest survival film Adrift, based on the true-life account of Tami Oldham Ashcraft. Does this newest survival tale find its stride (and isolation spirt) on the open waters or does it get lost in its own cinematic sea? Set during the year of 1983, young Tami Oldham (Shailene Woodley), is a carefree 20-something wandering the world and looking to leave her old life in San Diego behind. Making her way to the island of Tahiti, Tami crosses paths with Richard Sharp (Sam Claflin), a 30 something strapping you man whom she quickly takes liking to her. After spending sometime together, the pair soon fall properly in love with each other, sharing a love of travel and sailing in their romance. As such, Tami is somewhat hesitant to accompany Richard when he is hired by a wealthy couple to sail their luxurious boat across the Pacific Ocean (from Tahiti to California); an extensive journey that will further take Tami back to her former home. However, as their voyage gets underway and the journey to cross the Pacific begins, Tami and Richard’s journey turns into a nightmare when a hurricane’s destructive power ravages the seas, setting the pair’s boat directly in their path. Despite their best efforts to navigate around it, the pair gets swept up into the hurricane and are only able to survive through sheer luck. Once the hurricane storm passes, Tami finds their boat badly wrecked and drifting aimlessly in the waters as well as finding Richard badly injured. Tami must find the courage and strength within herself to not only keep them alive, but to try and keep their ship headed to the nearest destination of land (i.e. Hawaii) or to be forever stranded (and ultimately) die at sea. Much like what I said in my opening paragraph, stories of survival have always peaked viewer’s interest when it comes to watching feature films. Maybe it’s because it’s something extraordinary happens to an ordinary person or maybe its because it shows the actual raw core of a person’s’ spirt to live and survive through harsh environments and elements (i.e. the very essence wanting to live). Whatever the case, survival movies have been a fixed point of interest for many over the years in both features that are based on real-life and those born of fiction. Stories like 127 Hours, Everest, and Apollo 13 are some of my favorite, with each film capturing the essential themes of survival movie, but also captures a cinematic quality within its real-life source material. Even some other ones (that I didn’t mention above) are worth noting, including I am Legend, A Quiet Place, and The Grey. Yes, those might be a bit more fictitious (and a bit more fantastical) than those that are based on a real life, but they still hold the same survival premise and keeps viewers interested in their tale being told. Of course, this goes back to me seeing and reviewing the movie Adrift, the latest cinematic motion picture to tackle a real-life survival story. Naturally, being “based on a true story”, the narrative covered in this movie has been well-documented by the media and in new articles. That being said, I honestly didn’t know much about the Tami Oldham, Richard Sharp, or their voyage across the Pacific Ocean and getting caught in a hurricane’s path out at sea. Thus, my interest was slightly peaked when I first saw the movie’s trailers at my local theater. I didn’t hear much about the movie online (via internet “buzz”), but the film’s movie trailers showcased what I was to expect in the movie (i.e. a young couple who gets caught up in a survival mode). Plus, I do like both Shailene Woodley and Sam Claflin in their previous acting projects, so I knew that (at the very least) that I would mostly like their character performances of Tami and Richard. So, I decided to see Adrift and see if this movie was worthy of a motion picture representation. So…. did it? Well, not exactly. In truth, Adrift, while carrying a very compelling tale of survival of a real-life account, doesn’t have enough staying power to keep viewers completely engaged in its story. In short, the film is meaningful, but an uneven. Adrift is directed by Baltasar Kormakur, whose previous directorial works includes such films like Contraband, The Deep, and Everest. Given his experience in crafting Everest, Kormakur seems like the best choice in bringing Adrift to the silver screen. However, in contrast to Everest, which boasted a large cast and varying storyline threads to interweave, Kormakur seems to simplify everything on that front when it comes to approach Tami and Richard’s story, focusing most of the film’s runtime squarely on them (be it plight, love, or survival). Like many real-life stories, Adrift is based on the accounts told Tami Oldham (Tami Oldham Ashcraft in real life) in the non-fiction memoir “Adrift: A True Story of Love, Loss, and Survival”. Taking what Tami wrote and translating that into a film’s script are David Branson Smith and the Kendall brothers (Aaron and Jordan), giving a theatrical look (loosely based on what actually happened). Interestingly, Smith and Kendall Brothers decided to spilt Adrift’s narrative by splicing the sequences of past (mostly the romance scenes on how Tami and Richard met) to the present, which more shows the survival scenes of taking place after the vessel passed through the hurricane’s maelstrom. While not completely new or unorthodox, it’s a filmmaking tactic that comes with a double edge sword effect. On the positive side, the film has more tension in its narrative (rather than simply choosing a more linger path), especially since the film openings up with Tami waking up in a wrecked and damage vessel (scared and alone) as well as adding more of a dramatic effect by showing the boat caught up in the raging sea storm towards the film’s third act portion. The negative points about this decision I’ll mention in the below paragraphs. That being said, Kormakur seems more confident and ambitious when directing scenes that involve the stillness / slow passage of time during those survival moments, displaying the sense of dread and panic its quiet moments as well as scenes that showcase fear and panic (i.e. the scene where Tami and Richard are caught up in the hurricane’s maelstrom out at sea). Lastly, Kormakur, much like what he did with Everest, takes a modest production budget of roughly $35 million and utilizes its smartly in creating Adrift from production to post-production. Nowadays, with large and big budgeted endeavors being bloated with money, its still interesting to see how a smaller made film can still be produced and (sometimes) still have the same effect (theatrical and story wise) as the former. In terms of technical presentation, Adrift certainly does have the cinematic representation (even if the movie falters) that does make it enjoyable for those cinephiles out there. The overall craftmanship of the film is well-made and beautiful, especially during those wide-angle shots out on the open waters, giving off the vastness (and almost isolated feel) to the scene of which Tami and Richard’s vessel are stranded in. Thus, I really do have mention three-time Oscar winner (and frequent collaborator to Quentin Tarantino) cinematographer Robert Richardson, who finds a way to make ocean itself her to feel both inviting and threating (using some creative camera angles of being half submerged in water). What’s also equally important in Adrift is the film’s sound design, immersing its viewers of being at sea whether it’s the sound of being underwater (that eerie bubbling sound) or the sloshing of water in and surrounding the damage boat. Thus, I really do have to commend the whole sound department team for achieving that effect in the movie. Other technical film areas that should be mentioned are the make-up team (for making Tami and Richard have the withered and sunburnt look for pieces of the movie) as well as the film’s editor John Gilbert and Volker Bertelmann for his musical score for the feature. Unfortunately, Adrift can’t muster its ti strength to make a surefire cinematic endeavor, failing to strike a well-balance feature within its narrative storytelling. Much like what I said above, Adrift sort of has a “double edge sword” mantra that plays in part of the film’s structure. While the movie splits its narrative in its romance and survival pieces (i.e. flashing back to the past and in the present) in order to keep a sort of building tension, this move somewhat backfires and creates an uneven pacing problem within the two respective time narratives. For the romance aspect of the feature, its light and doesn’t have much depth. Yes, we (the viewers) see how Tami and Richard meet (and ultimately fall in love), but it’s so intermitted and spread too thin throughout the feature (again, going back and forth between the past and the present) that it feels half-baked as a sort of “montage” sequences of events of the pair falling in love. Thus, its hard to completely and whole heartedly for us (the viewer) to buy into their relationship with each other if the movie itself does not. The same thing can be said about the moments of the survival piece of the story. Yes, these scenes are more palpable than the romance scenes and have that real-life spark of humanity (i.e. doing something impossible in the face of adversity and enduring through some harsh odds), but again feel to choppy and intermitted in the feature that it lacks that dramatic “punch” for just a cinematic endeavor. There were so many different real-life horrors that Kormakur and his trio of writers could’ve drummed up and presented in the films (to add that extra “oomph”), but choose a more conventional outlet and flow to make the story of recent Hollywood films. While I was watching this movie, it made me remember 2015’s In the Heart of the Sea (a good story, great cast, but too mundane and boring in its latter half). Thus, that’s what I felt with Adrift. It just never really rises to the challenge of being cinematic great and I just had a hard time getting to the film’s groove (of which the movie itself never got into its own groove) by being too uneven its pacing and narrative structure. Additionally, while the movie is relatively the same runtime as an animated feature (the film clocks in around 96 minutes long), there are pieces that I kind of wished were expanded upon, especially those concern the backstory lives of Tami and Richard and towards the film’s ending events (i.e. the aftermath of film’s main event). Altogether, if I had to wrap it up on sentence, Adrift just simply lacks depth in almost all narrative aspects. 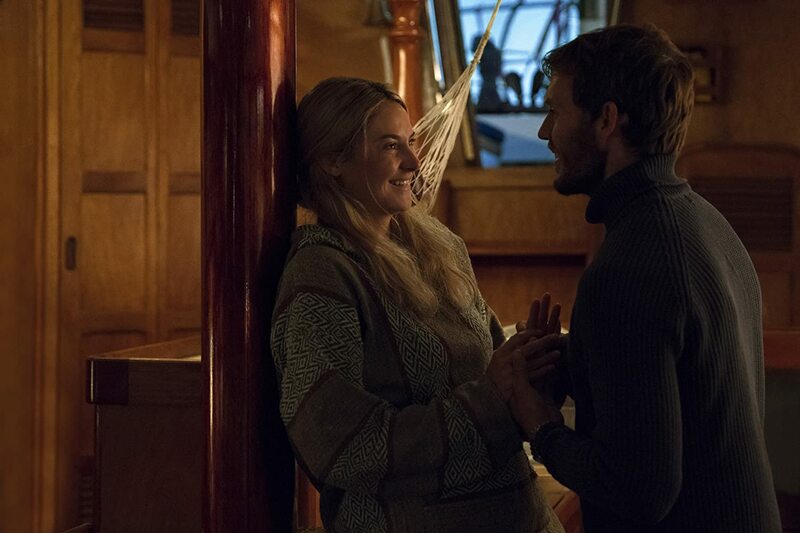 The cast in Adrift is small, but is effective in the film’s proceedings, finding a good representation in their two main leads (Tami Oldham and Richard Sharp) in actress Shailene Woodley and actor Sam Claflin. Of the two, Woodley, known for her roles in The Divergent movies as well as The Descendants and The Fault in Our Stars, shines the brightest as Tami. Much like you would expect, her character starts out as an aimlessly 20 something year old without much cares in the world, but soon gets swept up in a relationship and ultimately has to put her survival instincts to the test. Woodley is up to the task for such a challenge, selling all façade points of Tami and certainly does carry the weight of the film on her shoulders for large chunks of the film (more than half I would say). There’s a certain struggle and the fear and panic that she displays (of which we all would display during that situation) within her performance of being frightened young adult that was stranded at sea. All in all, Woodley delivers a great performance as Tami. Co-starring opposite her is Claflin as Richard Sharp, the man who falls in love with Tami and the one who prompts their trans-pacific voyage on the boat. Known for his roles in The Hunger Games movies as well as Me Before You and Pirates of the Caribbean: On Stranger Tides, Claflin is mildly good in the role. His acting is fine and does have “dreamy” look about him (i.e. tall, dark, and handsome) for the film’s narrative piece, but the movie doesn’t allow much for him. This is mostly not due to Claflin’s performance, but in the way that Kormakur and the fellow film script writers portrayed him in the movie. Given the fact that he doesn’t have much screen-time (more so than Woodley), Claflin’s Richard (of the two main leads) get shortchanged. As for their on-screen chemistry…. well, it’s okay. Its not passionate and really didn’t feel it as much as the movie wanted me to, but there were a few moments that I found it to be believable. After doing some research, I found out that actor Miles Teller (Whiplash and War Dogs), who is frequent co-star to Woodley, was originally suppose to play Richard, but had to pass on the project due to scheduling conflicts. The role was then given to Claflin shortly after. The result between Woodley and Claflin sort of ends up being a “fan fiction” result amongst teens of what if the characters of Tris Prior (from The Divergent Series) made a movie with Finnick Odair (from The Hunger Games movies). However, most of the reason for not believing Woodley and Claflin’s chemistry also derives from the lack of the romance aspect that Kormakur (as well as Smith, and the brothers Kendall) decided to forgo in the movie’s final cut, which makes it hard to fully care about these characters in way that heartfelt and emotional enduring. Basically, the chemistry is enough to get by, but gets muddled along the way and ends up being shortchanged, which isn’t a good thing. With most of the movie being focused on Woodley and Claflin’s performances of Tami and Richard, there isn’t much room in Adrift for supporting side players in the film. That being said, there are few worth mentioning, including actress Gracie Palmer (Shortland Street and Home and Away) as Deb and actor Jeffery Thomas (Spartacus: Gods of the Arena and Slow West) and actress Elizabeth Hawthorne (Filthy Rich and Underworld: Rise of the Lycans) who play Peter and Christine (respectfully); a the elder / wealthy couple that ask Richard to take their yacht across the Pacific. Given how the narrative structure of the film is setup, these three characters mostly just served one or two scenes in the movie and mostly serve either background continuity or a major plot point. Again, its how the movie is structured, so its perfectly fine with me. What starts out as a romantic seafaring voyage for Tami Oldham (with her lover) becomes an unimaginable nightmare and a fight to survive being stranded out at sea in the movie Adrift. Director Baltasar Kormakur newest film takes the harrowing (and almost inspirational) real-life survival story of a young woman, who faced impossible odds, and brings it under the lens of a cinematic microscope, examining the fear, panic, and determination of a person’s will to survive such a horrifying ordeal. Unfortunately, while the movie’s main plot is palpable and the film finds a strong lead within Shailene Woodley’s performance, it fails to strike a chord between real-life events and being cinematically memorable, producing an uneven feature that fails to build a strong heartfelt romance within its two main characters as well as creating some nerve-racking survival tension. To me, the movie was adequately okay. I wasn’t exactly thrilled by it, but I wasn’t disappointed by either. So, I guess it sort of breaks even (somewhere in between being mediocre and forgetful). Thus, my recommendation for this movie is a definite “Rent It” as there’s really no rush to see in theaters. Plus, given the film is not super violent nor explicit language or sexual content, I have feeling that it will be many syndicated TV channels (i.e. TBS, TNT, FX, etc.) sometime next year. In the end, while the real-life story of what happened to Tami and Richard is indeed a harrowing and inspirational one (one that test man vs. nature and the indomitable power of the human spirit), Adrift, which will probably disappear into the background of the 2018 movie releases, has a hard time staying afloat and sort gets stuck…. lost in its own cinematic sea. I can’t take another movie about a couple of people boating, floating, or sinking in the ocean. I tortured myself always thinking “this one looks better” but every time just five minutes into it I just wish they would get eaten by a shark and end the movie for it’s own good. Thanks for the review but I’ll even pass on the rental.